Back in August I managed to rescue two items that would have previously been destined for a lift on the shelf before falling into the landfill. I would use the term ‘upcycle’ here but it is more renewing. I am pretty lucky as while I do not have a sewing machine or the associated skills (planning to learn these but this is an addition to a looonngg list of things I plan to learn) I do have a mother who made many of my clothes when I was wee and who used to make her own clothes. 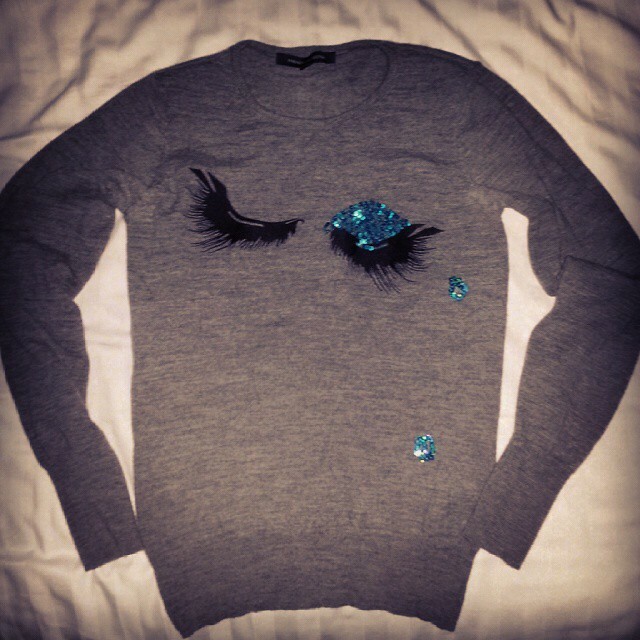 Thanks to her I have a lovely grey jumper with additional sparkle and a sleeveless top perfect for layering. This jumper had been attacked by the moths that have taken up residence in my home last year (we have tried to get rid of them and hopefully it has worked). Lots of small holes meant that the jumper was unwearable – I had thought of wearing it with a bright top underneath but I worried all which would happen would be that the holes would increase in size. After a bit of deal brokering my mum offered to help me. She was little concerned that we wouldn’t be able to match the wool exactly which allowed us to try a technique that I have been fancying called ‘visible remend’ where you make the mend part of the design. Well my mum ended up running with this and chose some bright blue sequins to match the existing ones and after darning the holes covered them with the sequins. I think it looks great and I am really pleased, cheers mum! The other item she helped me convert was a top I had that while lovely had a huge rip under the arm, so I cut the arms off and she helped me to tidy it up and then added the bias binding. The top had such a lovely drape on it that I am pleased I can still wear it and while it is starting to get a little cold to wear it (even with a cardigan in the office it was still a bit parky) when the weather gets warmer it will be great! I am really enjoying trying to make my clothes last longer and learn some new skills. It is all starting to build up to a new challenge. A Challenge for Every Month – Trying to catch my tail! Okay so I haven’t been that organised on this front, I will hold my hands up and say that even though I could pretend that I have been rushed off my feet well it is probably a lie. There have been times when I have been sitting around my flat thinking ‘I could look into…’ then just not doing so. My apologies, as with everyone life sometimes takes over 🙂 Originally I was going to do a long post about the things I have been up to in July to try and get my ethical/sustainable fashion challenges back on track but you lucky, lucky people I have decided to break this post up into three short ones. So first up mending, and some more inspiration! I have been busily mending things. I have finally hemmed a pair of black trousers for work only to promptly discover the zip keeps opening at random moments, not sure I am up to replacing a zip so I think I might take these to a tailor until then I am simply wearing long tops with them to ensure that my dignity remains intact. 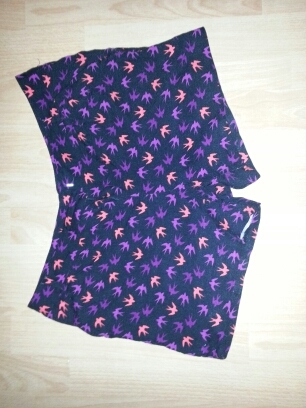 I also hemmed some shorts as well and they are looking really nice. 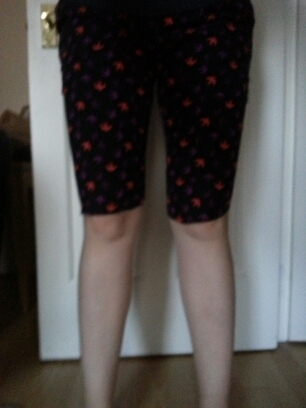 I love shorts, and although I have often thought of getting rid of these particular tweed ones or relegating them to Deerstalker wear they keep coming back into rotation. 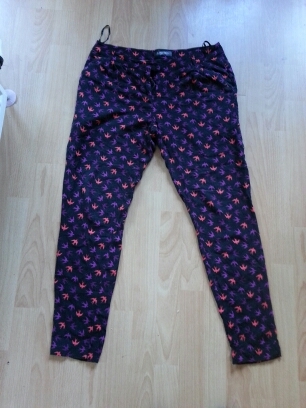 Still left to hem with the wonder that is Wunderweb are a pair of jodhpurs that I have currently just stitched into place and I want to try and patch up some exercise leggings. I also have a jumper that my mother is going to help me darn, she hasn’t been convinced that we can mend this one as she was confident that any darning attempt would be visible so we were thinking of trying a visible re-mend – I think I have mentioned this before. After chatting it through I think my mum is off and running with an idea as she wants to get sequins and bright turquoise wool – sounds pretty cool. As another bit of inspiration one of our friends has an awesome style all of her own (all our friends have awesome style I hasten to add) but her look is great at festivals and just hanging out in the warm weather lately. She tends to wear sparkly bra tops or crop tops under baggier sleeveless tops tied at the side, she is a lot slimmer than me and don’t worry Edinburgh the sparkly bra tops are unlikely to be worn by me but I like the baggy tshirt tied at the side thing. On that note I thought I would take a large, slightly shapeless tshirt that I was given and see what I can do with it! The ideas on Shirtworks, link below made me think maybe I can try this. So I am going to try option 2. Author theInelegantHorseRiderPosted on August 4, 2014 August 4, 2014 Categories A Challenge for every month, Style, Sustainable fashion2 Comments on A Challenge for Every Month – Trying to catch my tail! In April I took part in Fashion Revolution Day on the 24th (the 1st anniversary of the Rana Plaza tragedy in Bangladesh that killed 1,138 and injured many, many more). Fashion Revolution Day is designed to “bring everyone in the fashion value chain together and help to raise awareness of the true cost of fashion, show the world that change is possible, and celebrate all those involved in creating a more sustainable future.” This was one of my challenges that I was particularly keen to do and that I hoped would help show a change, however small in the industry and this year the focus was on transparency in the supply chain – something I feel is lacking for most companies. I deliberately didn’t choose an item from one of the more ethical and sustainable companies I buy from as I felt it would be more interesting to hear what a high street brand had to say. 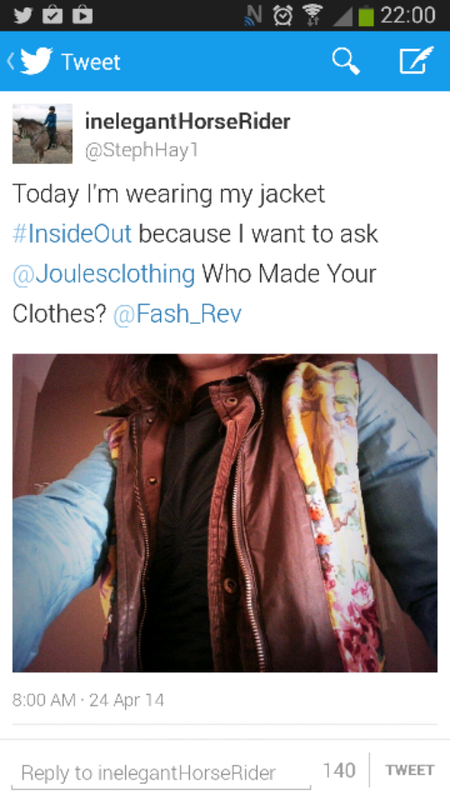 I chose my brown wax jacket from Joules which I have had for a few years now. Author theInelegantHorseRiderPosted on May 6, 2014 May 11, 2014 Categories A Challenge for every month, Clothes swap, Fashion Revolution, Style, Sustainable fashionLeave a comment on April Challenge – Completed! February seems to have passed in a blur, from reading a few of the blogs I follow I think most people feel the same way! Luckily by default I did complete a challenge in February as I bought nothing! Well nothing clothing-wise, which was a revelation in a way as I realised that even on the WWC last year I still bought a lot of stuff (really just rediscovered eBay and then had to ban myself 😉 ). I definitely have enough clothing to see me through the days so I think a few self-imposed months without buying anything new definitely does me some good, and of course the bank balance which will help me to achieve some of my other goals for the year! This month I am going to be taking a look at how to dispose of clothing, namely bras as I have had no idea what to do with them until I went to an express Pilates class!